I just got back from a week down at Litchfield Beach and Golf Resort, having a good time, playing a little golf, and spending time on the beach with my family. Vacations are perfect examples of why we need the foundational documents in place. Just like you’re checking the oil in your car before you go on vacation, you need to be checking your legal documents to make sure that you have your healthcare powers of attorney, your general durable power of attorney, your living will, and your will in place and set prior to going on vacation. Summertime is a great time to go on vacation, hang out with the family, but what happens if you and your wife are traveling – maybe to Tennessee, maybe to the mountains of North Carolina, maybe to the beach – and something happens. We want to make sure you have those healthcare documents with you and directives, so you and the hospital down there would know who makes healthcare decisions for you. You could show those documents to the healthcare facility, the doctors, the nurses. Anytime you narrow down whatever you’re doing and focus on a small area of any trade or profession – it doesn’t matter what you area of expertise is, if you’re a lawyer, a small businessman or woman, or a district attorney – then you’re going to see all of these other nooks and crannies when you put it under a microscope. 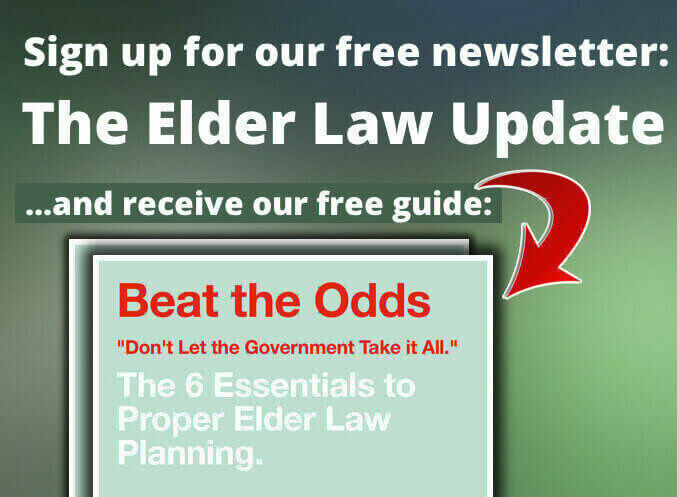 When we started doing that with elder law several years ago, it became apparent to me that having your healthcare power of attorney and your general durable power of attorney locked up back at the house or in a safety deposit box is the worst place it could be. Who’s going to find it? And where’s the key? We started offering our eDocs Access program, which is a system that it dawned on me was just what seniors needed. In our digital day and age, where we can access our bank accounts online with secure systems, why not deploy that same technology so that you have your healthcare power of attorney, your general durable power of attorney, your living will, your will, and even your deeds to property? We put those up there too. Your Ladybird deeds. Everything goes there. It’s bank-level, encrypted security, so no one’s going to be able to see your documents. You create your own password for it, using a link that you receive in an e-mail. You get a card to put it in your wallet. 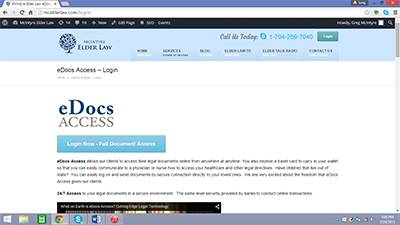 Log onto it straight from our website at McElderLaw.com, get on there, and put in your username and password. You’re able to see all your healthcare documents. You can share some of those documents. For instance, I’m down at the beach and, heaven forbid, I get bitten by Jaws. To save my life, they’re going to want to know who to talk to, to make decisions for my healthcare issues. Even though we didn’t bring the paper documents with us, my wife can pull the healthcare directives up right on her iPhone. There it is. She could even print it right there at the hospital or local, maybe at the nurses station. Pull up my documents right on eDocs Access, and she could save me and make the right medical and healthcare choices for me. Not only do you have access and a card, but you can grant access to family members who may live out of state as well. If something happens, they have all your documents right there, so they can know what to do. The kids, for instance, can know what to do should you, heaven forbid, have some tragic circumstance while you’re vacationing. But I might not want my kids to see my will. I might just want them to see the healthcare power of attorney, where maybe they’re second or third in line on the bench. I can pare it down and pick or choose what they can see. Who knows when tragedy is going to strike or healthcare problems arise. I don’t. I hope a long time from now. I have a wonderful, ever expanding client base that we want to take care of for life. 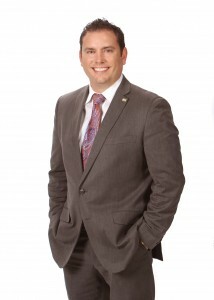 We want to be your most trusted adviser for your entire family at McIntyre Elder Law.